Recently The Man of the House and I went to the local farmer’s market. 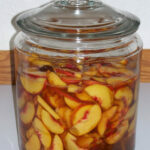 Several booths had fresh peaches so we bought a bunch and I’ve started a batch of peach liqueur. 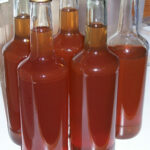 The recipe I used is adapted from Cordials from Your Kitchen . This recipe will yield one gallon of liqueur. Cut the peaches in half and remove the pits. (Don’t throw those pits away though! They’re going to go into the liqueur.) Slice the peaches. Put everything into a 2-gallon container that has a tight-fitting lid. Give it a good stir and then cover. Put it in a cool dark place for two weeks. Give it a good shake once in awhile during the two weeks so that things don’t clump together. After two weeks use a fine-mesh strainer to get the solids (including the pits) out. Discard the solids. 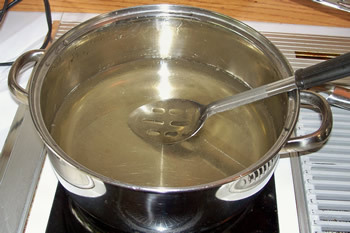 Transfer the liquid into a clean container. Cover and let stand for another 2 or 3 weeks. Rack or filter the liqueur into its final container. (We’re going to use clean wine bottles.) You should get about one gallon of liqueur. I think I missed reading something! What do I do with the peach pits? True Rosie – At this stage the pits will go into the 2 gallon container along with everything else. Later they’ll be strained out. I followed the recipe but after a week the liquid oozed out aLL over my pantry. What did I do wrong? Please advise as to how to avoid this happening again. Wadda – I don’t think that the volume of mine changed at all. But then again, as you can see by the photo, I did have a little room. How much room did you have in the jar? Since this isn’t a wine or beer there isn’t fermentation. That’s what usually causes accidents like the one you describe. Did it foam or bubble? If so, that means that fermentation was going on and that’s not what you want for this. Mine id have bubbles in it. Why did it ferment? I would like to try again. any advice? Sorry to take so long to get back to you. I’m seriously thinking about having myself cloned. 🙂 I asked the Man of the House about this since he actually makes wine and beer. He wondered if you put the full amount of vodka in. The alcohol content in the vodka should keep all the nasties away. 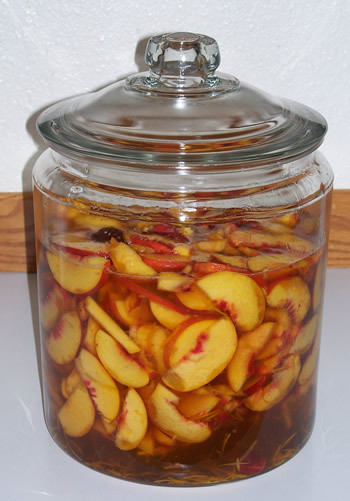 Sounds like maybe the peaches had some yeast on them when they went into the jar.